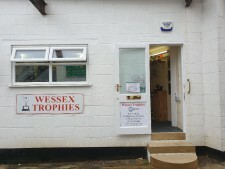 Wessex Trophies is a family run business established in 2008 and we pride ourselves on our Service, Quality and Price. We can find the perfect awards to meet your requirements and budget. We have a shop based in Broadstone which is near Poole in Dorset with over 2,000 samples to look at and lots of stock to take away and also our internet online website with secure payment facilities via Credit/Debit cards & Paypal. Using our own in house engraving machines and a unique ability to replicate coloured images for Company or Club Logos, we can look after your entire presentation needs. Under the Catalogues Tab there are lots and lots of awards to look through, with an amazing choice. We also have a small selection of trophies and awards listed on the left hand side, which are available to buy and also to give you some ideas. However if you need any help to choose your award or you require any further information please do not hesitate to contact us and we will be happy to help.